Wednesday 7th September 2016 is National Threatened Species Day and commemorates the 80th anniversary of the death of the last known (captive) thylacine. 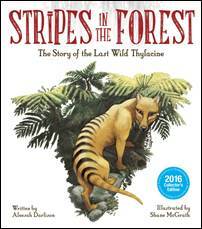 Stripes in the Forest by award-winning children’s author, Aleesah Darlison, is a poignant and emotive story of an iconic species lost. Told from the perspective of the last wild, female Tasmanian tiger, it provides readers with an insight into the rare beauty of these amazing animals, explains their fight for survival and provides important lessons for future generations. The book is one of our Recommended Reads for September, and we have a copy up for grabs in our competition. We are very pleased that Aleesah was able to take some time out of her VERY busy schedule to chat with us. Thanks Aleesah! You’ve recently been down in Tassie for a tour and some events, how did you get on here? I absolutely loved touring Tassie. Besides all the beautiful scenery and delicious food, the children, teachers and parents I visited at various schools and libraries throughout the state were very friendly and welcoming. My talks about thylacines generated some rich and passionate discussion across all ages, which was fantastic to see. It seems everyone has a thylacine story to tell! Of course, this meant that I was able to collect even more information about those beautiful creatures to share with others. Tell us a little bit about Stripes in the Forest, and how you came to write it. I’ve always been obsessed with thylacines and the story of their extinction. They were such a unique and iconic species, and their demise happened so recently, so quickly. To me, it’s almost like they could still be out there. And that’s a concept I address in the book. Being an author, I’m able to write about the subjects that most interest me, so it was natural for me to want to write a story about thylacines. I’ve been very lucky to work with Big Sky Publishing. They loved the manuscript from the start and Shane McGrath is the perfect illustrator for the book. Shane has done a great job of keeping the thylacine realistic and has built in multiple layers of storytelling in his artwork to support the text. How much of a challenge was it to write from the perspective of a thylacine? The thylacine’s voice, her story, came to me instantly and it always seemed natural. Readers will notice when they read the book that the female thylacine is not just a mother of her own pups; she’s the mother of her species. She speaks for all who were lost. What was more of a challenge was finding information about thylacines to keep the story and key facts as correct as possible. Unfortunately, the information we have about thylacines is quite limited, various information sources are not always accurate and sometimes there’s disagreement or disparity between historical or biological information that we have on record. Do you try out your ideas and writing on your own children first? Sometimes I test my stories on my children. My 8 year old daughter is a terrific beta reader because she’s usually fairly honest with her feedback. She’ll tell me if I’m hitting the mark with my characters and the emotions being generated by the story or if there’s something missing. Having a child read your work can also help you understand whether you’re pitching it at the correct age group in terms of their understanding of language, vocabulary and themes. If your 8 year old doesn’t understand the story you’ve written for 8 year olds, it probably means you need to have another look at it. What is the most fun or interesting (or difficult!) thing about doing events for children? Every day is different! Kids have a brilliant sense of humour, they love to laugh, and they have fantastic imaginations. They’re also often brutally honest. I find if you want to connect with kids, you need to be passionate about what you’re talking about (and writing about) and you have to get them involved in your talk. They need to be active in their listening, otherwise they switch off and might start yawning, talking to their friends or mucking up. You need a lot of energy and variety when speaking with children. And afterwards, you’ll probably need a nice long lie down. Do you think you’ll ever write for adults? You’re very involved with the NSW Writers Centre – as the director of their Kids and YA Festival – do you think that state writers’ centres will continue to have an important role going forward? Definitely. The state writers’ centres are crucial to all aspiring, emerging and established authors. The people who work there do so much that isn’t always seen, there’s a lot of behind-the-scenes and weekend work being done. Not just when it comes to festivals but to every other event they hold and initiative they set up. Writers’ Centres are also coming under increased financial pressure due to lack of sponsorships, donations and government funding. The centres are often being asked to do more for less. I work a lot with the Queensland Writers’ Centre also. They regularly hold events, including regional workshops and courses, and they’re instrumental in writers’ mentorship programs. These type of services are crucial to the future of literature and publishing in Australia. Who or what else do you think is important to provide support and a sense of community for writers? The children’s publishing industry has an incredibly strong and supportive network of authors and illustrators. I’ve learned so much from other authors just by asking questions, asking for help, and observing what they do. It’s an industry that shares opportunities, advice and best of all, friendship. The CBCA sub-branches in NSW have been a huge help and support to many authors starting out, as has SCBWI, both in NSW and QLD where I now live. Local councils and CAL have been a great support to writers also, providing much-needed grant funding. For instance, the Sunshine Coast Council supported me with funding to speak at conferences and festivals in Canada and the US in 2015 and this year they’ve provided grant funding for me to present at the SCBWI Conference in Sydney. Well, I’m very glad I am a writer, I couldn’t imagine being anything else now! But, if I had to choose … I think I’d probably still be working as a marketing manager somewhere. It’s a fun job, but not as fun as writing. I write when I can, whenever I can. I’ve had a pretty gruelling schedule of performances during 2016 plus I have four children, one of whom is only two years old … large blocks of time to write haven’t been very forthcoming lately, so I have to write whenever I can. That might be early in the morning before everyone else is up, or when I’m travelling and away from the family, after my daytime performances are finished I might write late into the night. I usually start with a notebook if it’s a picture book, but quickly move onto my laptop, which helps me write and edit quickly as I touch type. If I can’t get hold of pen and paper or laptop, I use the voice recorder or notes app on my iPhone. Where there’s a will, there’s a way. I do tend read a lot of children’s books. I’m just a kid at heart, I guess. The two latest books I read were David Walliams’ Gangsta Granny and Tristan Bancks’ Two Wolves, which was shortlisted for the Prime Minister’s Literary Awards last year. Both great books for different reasons. Aleesah will be back down in Tasmania later this year for some more events, which we will share details of on our website. 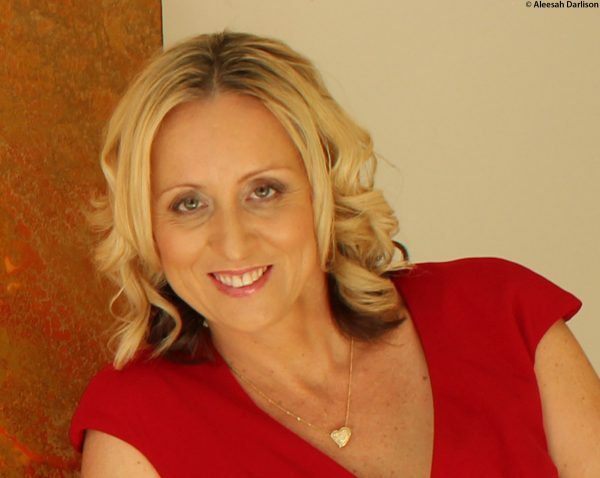 In the meantime, you can keep up to date with her news on her website, Facebook page and Twitter account.